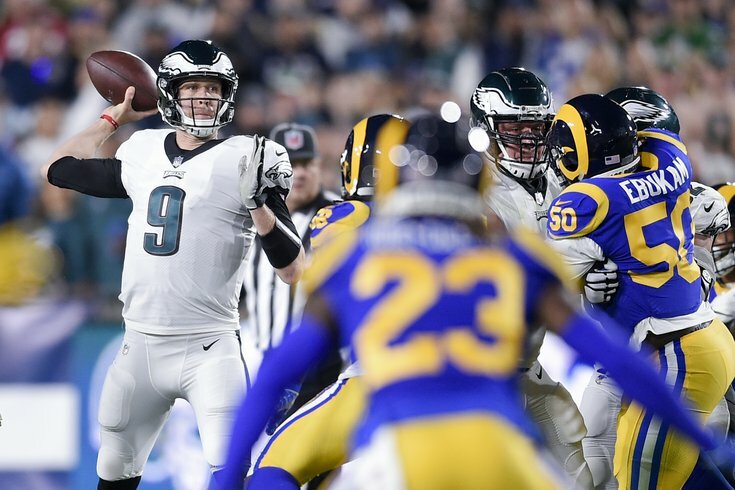 Philadephia Eagles quarterback Nick Foles attempts a pass during the first half against the Los Angeles Rams at Los Angeles Memorial Coliseum. Fresh off their latest frustrating loss to the Dallas Cowboys last Sunday, the Philadelphia Eagles head to Los Angeles to take on the Rams in prime time on Sunday Night Football. The final injury report for this game shows the contrast of these two teams, as the Eagles' have a mile-long list of players on their injury report, while the Rams list precisely nobody on theirs. The biggest story of the week in Philly was the revelation of Carson Wentz's stress fracture in his back. Wentz will obviously not play in this game. You can find the final Eagles-Rams injury report here. Wentz aside, the Eagles' biggest injury issues this season have occurred in their secondary, where they will be without four of their top five defensive backs, in Jalen Mills, Ronald Darby, Rodney McLeod, and Sidney Jones. That is bad news against a potent Rams offense that is scoring 32.7 points per game. The Eagles are currently 13-point underdogs heading into this matchup, which was the biggest line of the week. As expected, everyone and their mothers are picking the Rams, both among PhillyVoice's staff, and writers elsewhere.